Letter sent by the UN Secretary-General Ban Ki Moon to the Security Council, in which the territories under UN trusteeship are analysed. Besides the confirmation, once more, of the merely Italian and [ex] Yugoslavian civil administration, The Free Territory of Trieste is not given an end date, but rather its merely change of civil administration, which – without any doubt – does not imply any sovereignty’s modification: only the citizens of Trieste do have the sovereignty over their own State. TRIEST NGO was founded in 2013 with the aim to support, in the competent international seats, the popular actions undertook in the Free Territory of Trieste. In these years, despite the scarce means and the heavy odds, Triest NGO has performed an intensive diplomatic action, in spite of all the delirious harassment carried out by those who would not like the FTT/TLT/STO to be fully implemented. These actions led to an achievement which will determine, in the way we all wish, the future of Trieste, its territory and its Port. After the active participation, between November 2014 and November 2015, at four work sessions of the UN Office of Geneva, one of the European Parliament of Brussels and two meetings at the Russian embassy in Rome, Triest NGO has indeed met, in confidential meetings, UN High Commissioners and Russian diplomats (working on behalf of the Russian President Vladimir Putin), to whom documents reporting the reasons of the citizens of the FTT were handed over. Most of all, the first and only international impartial expertise on the Question of Trieste was handed over. This expertise, commissioned by Triest NGO in 2013, was drew up by professors Tom Grant and Guglielmo Verdirame, leading exponents of the Studio 20 Essex of London, one of the most prestigious firms of Public International Law. The importance of the report on the Italian non-compliance towards the International Port of Trieste (“Port Inquiry”). Click here to read. Worthy of note are also the meetings held on September, 24th 2015 at the Palais des Nations in Geneva, during the work session named “Focus on Trieste”. Arlon Stok (spokesman), Stefano Ferluga and Nicola Sponza faced for an hour the OHCHR Commission, relating to eight UN Commissioners the heavy Italian non-compliances towards the International Port of Trieste, as described in the Triest NGO’s report called “Port Inquiry” (link here), while Alessandro Gombač attended a meeting with Pol Planas, of the Office for High Commissioner for Human Rights. Planas affirmed that “everyone who should know, knows, and everyone who should be made aware of, was informed”; that “UN ist looking for a political solution to the Question of Trieste” and that “nobody, as matters stand, would take the responsibility of signing a document concerning the Question of Trieste”. Furthermore, Planas has strongly urged the citizens of Trieste to keep on claiming their human rights, starting from the request of their right to citizenship. Given the geopolitical, economic, ethnical and cultural implications in any decision about the Question of Trieste, we were told that both the outcome of the “Port Inquiry” procedure as well as the one about the right to citizenship had to be classified. Italy tried to belittle the whole question “sweeping it under the rug” – on September 25th, at the end of the “Focus on Trieste” meeting, Enrico Serra, Ambassador at the UN Office in Geneva, has long praised Italy’s past and present deeds for the respect of Human Rights in the world. But not in the Free Territory of Trieste. These are the legal basis of our Territory, according to the UN Security Council. All this, up to yesterday. 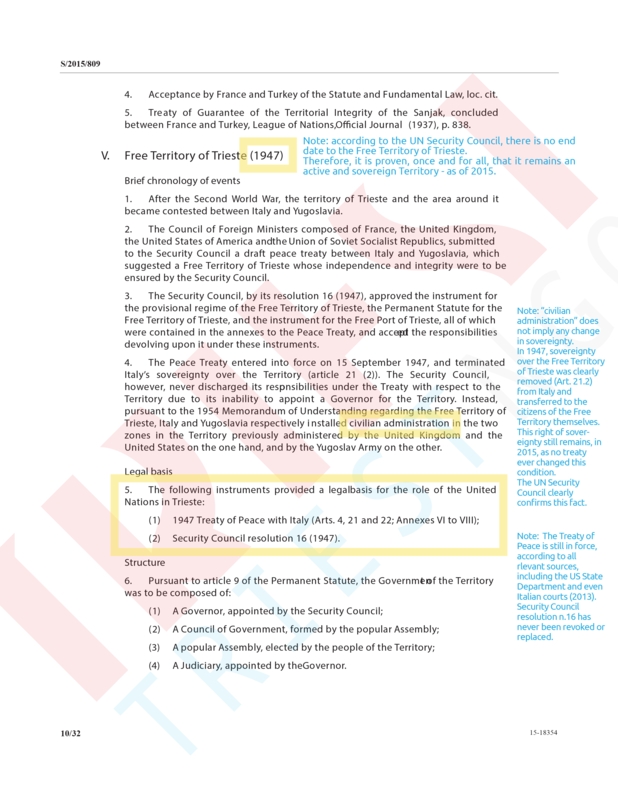 One month after the “Focus on Trieste” debate, indeed, the UN Secretary-General Ban Ki Moon sent a letter to the Security Council, in which he defines the world Territories under direct influence of the Security Council itself. 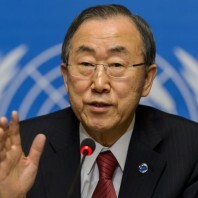 The Treaty of Osimo was not considered at all by the Secretary of the UN Security Council, Ban Ki Moon. At the fifth point appears the Free Territory of Trieste, the one spreading from the Timavo river to the Quieto. The UN Secretary-General affirms, on November 21st 2015, that the two only documents determining the current juridical status of the Free Territory of Trieste are the Security Council resolution 16 (10 January 1947) and the 1947 Treaty of Peace with Italy. The London Memorandum of Understanding is confined only as a formula, whose function is of merely transmission of the civil administration of the two TLT/STO/FTT’s zones, at the time under military administration of the Anglo-American and Yugoslavian armies. The civil administration of a Sovereign Territory does not imply any change of sovereignty. TO THE Italian and [ex] Yugoslavian CIVIL ADMINISTRATION, not to the sovereignty. The Treaty of Osimo is not mentioned at all, as it appears logical to anyone informed on the matter. The UN Secretary-General affirms, besides, the current validity of Annexes VI and VIII, determining as far as today, in 2016, the existence de-facto of the Free Territory of Trieste. For Trieste, its Port and its Territory, nothing will be the same.